Market direction: mildly UP. New target: 843. Like for the other 2 indices, we have been suprised by market activity on breakout of 812.50 key level. AdStoK is very bullish with a crossover that came a little too early. One should wait for RUT to settle on new target (828 first)to assess the situation going forward. A slowdown is possible. Daily: Mildly UP to UP. AdStoK is still bullish and should carry on its bumpy ride to higher levels now that the key 812.50 level is behind us. The next levels are 829, 843 then July highs and ultimately 875. Entropy and AdStoK now show more clear the way up to 843 over the next few weeks. The Swing indicator should turn around any time now. 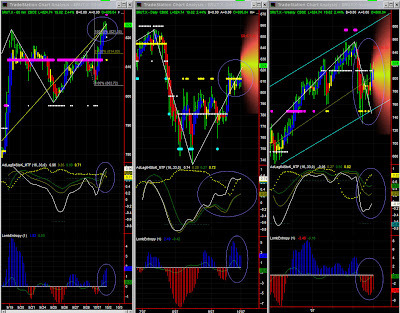 It has so far been a good representation of the hesitations we've had in lower time frames. Market direction: Neutral to mildly UP. July highs in sight now. 60mins: mildly UP to UP, until forthcoming resistance level. We admittedly didn't quite anticipate the breakout reaction on finally passing the 153.50 key level. AdStoK is bullish but Entropy shows possible signes of peaking and the MM range is actually narrower, indicating a possible trading range around this new 154.50 level. A Fib pattern has reached its OP, however there is a XOP level concurring with the new MM target. This would mean testing July highs in the coming days. AdStoK and Entropy are both stabilising, which is an unusual situation for Entropy. One can only expect continuation of the same situation, i.e. slow steady increase, at least until AdStoK lines cross. Entropy at 3 is historically very high, so a slowdown (rate of increase) is almost certain. One should note that the current resistance level at 150 is still in place, indicating some difficulty going higher (at least for now). The Swing indicator has finally turned UP! Entropy is slowly looking better, and the AdStoK white line is clearly showing the "U" shape indicating recovery at least until lines cross. So, for the time being, no visible change in market dynamics coming (despite expectations of a bumpy October). One will have to check where lines cross, as there is a chance of divergence in this indicator. Market direction: neutral to mildly UP, until 2125 resistance is truly tested. Probable slowdown then. 60mins: mildly up to up, until new resistance level at 2125. 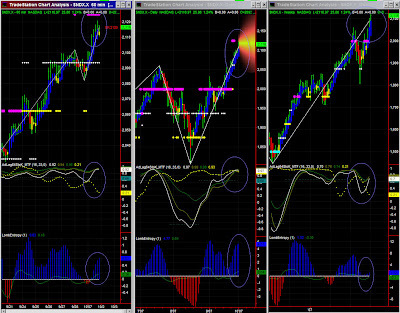 While our outlook was correct, we have been fooled by NDX on 'stall' MM level. NDX will now hit 2125 and we have to now see what comes next. NDX is in an overall very bullish trend, indicating studying higher time frames. Daily: mildly UP. 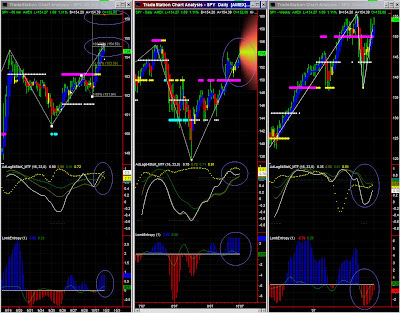 Possible slowdown on coming resistance, due to extreme overbought situation. NDX is so strong it could go beyond 2125. Entropy is close to 5 which is a very high level at this time frame, hence a slow down is likely after it peaks. AdStoK is at a crossover point, however one must be cautious is extreme overbought situation and wait for a steeper gradient to leave overbought zone, hence some significant retracement to confirm a slowdown. In the meantime, no visible change in direction ahead. AdStoK lines should soon meet, but significance level is low at this time frame, so this is nothing more than a background information. One can check for a possible change in dynamics on AdStoK line crossover, which could happen around the much anticipated 2125 level.